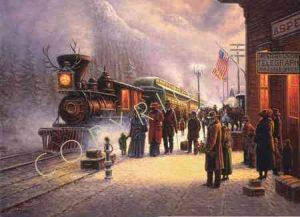 As the train rolls into the depot in old - time Aspen, people have gathered to meet friends and relatives. Many had prospered in the mines scattered through the Rocky Mountains which surround the small town. The gentleman on this snowy night. He obviously intends to impress someone special arriving on the Denver.